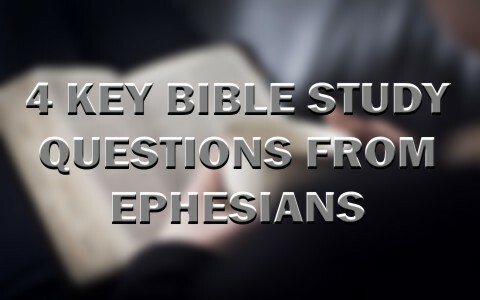 What are 4 key Bible Study Questions from the Book of Ephesians? What ones would you add? Will Believers be Trophies of Grace? Have you ever heard of this concept before? It has been called many things….God’s showcase, God’s trophy display but I like “Trophies of Grace” because that is what seems to best fit what some of the Bible verses in Ephesians seem to be saying. This might be new to you so let me give you the Bible verses that I believe show that this might be the case. At first we “were by nature children of wrath, like the rest of mankind” (Eph 2:3) “But God, being rich in mercy, because of the great love with which he loved us, even when we were dead in our trespasses, made us alive together with Christ—by grace you have been saved” (Eph 2:4-5). Now since these things are true, and God has already “raised us up with him and seated us with him in the heavenly places in Christ Jesus so that in the coming ages he might show the immeasurable riches of his grace in kindness toward us in Christ Jesus” (Eph 2:6-7). Did you catch it? God has saved us by His amazing grace for the purpose of showing “the immeasurable riches of his grace in kindness toward us in Christ Jesus.” Who is He going to show these immeasurable riches too? The angels? Those who are born into the kingdom after Jesus rules on the earth in the New Jerusalem? Perhaps both? Either way, it is all a glory to God. There’s more to this. It is “In him we have obtained an inheritance, having been predestined according to the purpose of him who works all things according to the counsel of his will” (Eph 1:11) but for what purpose? God’s answer is “that we who were the first to hope in Christ might be to the praise of his glory” (Eph 1:12). We who are saved will be a praise of God because they’ll see us and won’t say “Who are these who are saved?” but “Who was He Who saved these?” This might seem a stretch to you but think about it? Who deserves the credit for our being saved? Who can boast about their own salvation (Eph 2:8-9)? Doesn’t God deserve all credit? So why shouldn’t it be God “that in the coming ages he might show the immeasurable riches of his grace in kindness toward us in Christ Jesus” (Eph 2:7) to all of His created creatures who are then alive and for those in the ages to come, as yet unborn? Does Predestination Violate Human Free Will? This is certainly a paradox for a lot of believers. We are predestined by God but we have free will. How can this be reconciled? Let me put it this way. When my wife and I married many years ago we predetermined to have children and even while my wife was pregnant, we already loved them. My wife used to read books to them while still pregnant. After they were born, they had no trouble knowing her voice and educational research indicates the value of reading to children even while they are in the womb. In this way God loved us before we even existed and in fact, before the earth did. How amazing is that? My little mind cannot wrap around this fact. God has said “he predestined us for adoption as sons through Jesus Christ, according to the purpose of his will” (Eph 1:5) and “In him we have obtained an inheritance, having been predestined according to the purpose of him who works all things according to the counsel of his will” (Eph 1:11). How can He predestine us ahead of time, as part of His divine will and His own good counsel but leaves it up to us to choose Christ? Can’t tell you. Don’t know how to explain it. It’s like Albert Einstein before his death was still trying to figure out the constructs of light and electricity but even though one of the most brilliant men of all time couldn’t comprehend how these worked didn’t mean that they don’t. I don’t either. I have the free will to flip the light switch on even though I don’t understand it. Even though I don’t understand it doesn’t mean it doesn’t still work. All I know for sure is “In love he predestined us for adoption as sons” and daughters (Eph 1:4c-5a) and that’s enough for me. Jesus puts the “whoever will” with “will come to me” in these two verses: “Whoever comes to me will never be hungry again. Whoever believes in me will never be thirsty” (John 6:35) and “All that the Father gives me will come to me, and whoever comes to me I will never cast out” (John 6:37). All that the Father gives to Jesus “will come to” Him but those who do come to Him do so freely and if they do, they “will never be cast out.” They seem oppositional but in fact, both are true. More than once, someone has asked me “Is it free will or is it God’s will” and I say “Yes!” It’s not an either/or but a yes! Just as Jesus said “that whoever believes in him shall not perish but have eternal life” (John 3:16b). Who is the Real Ruler of the World? God is sovereign over all. Where man rules, God overrules but what about the verses that say that Satan is the god of this world? Isn’t God ruling this world? Martin Luther once said that “even the Devil is God’s Devil” so the Devil can do no more than God allows and for now, He is allowing Satan to have sway over the earth but God has a history of using evil for God. Look at the cross. Look at Joseph in prison in Egypt. There are dozens of examples where God uses evil to have good come out of it. In Ephesians 6:12 is says “we do not wrestle against flesh and blood, but against the rulers, against the authorities, against the cosmic powers over this present darkness, against the spiritual forces of evil in the heavenly places.” For those who are not saved “the god of this world has blinded the minds of the unbelievers, to keep them from seeing the light of the gospel of the glory of Christ, who is the image of God” (2 Cor 4:4). The “god of this world” is clearly Satan and he is heading up these “spiritual forces of evil in heavenly places” and they seem to be forces of evil in places of rulership. These “cosmic powers” are why we are not really wrestling “against flesh and blood.” That’s why Paul says that we need to “Put on the whole armor of God, that you may be able to stand against the schemes of the devil” (Eph 6:11) so “that you may be able to withstand in the evil day” (Eph 6:13). He may be the “god of this world” but He’s not God over this world. What is the Mystery of Christ and the Church? Marriage is a holy, sanctified union that is sanctioned by God and it is a real mystery. Just ask any husband or wife. How two that are opposite can be one is such a great mystery. Paul thought the husband and the wife were a supreme example of the relationship between the Body of Christ, the church (which is the Bride of Christ) and Jesus Christ (the Bridegroom). How must the husband love the wife? Paul tells us that “ Husbands, love your wives, as Christ loved the church and gave himself up for he” (Eph 5:25). That sounds like a worthy goal but it seems humanly impossible to do, doesn’t it? Even so, that is what husbands are to do. Just as Jesus died for His Bride, husbands must be willing to die for their wives. This dying could be a dying to self, a dying of their own self-interests, a dying to their own wills and wants…and giving his life for His bride. No wonder it’s called a mystery. It’s difficult to figure out. We husband’s might not understand but “let each one of you love his wife as himself” (Eph 5:33a). On the other hand, the wife should “see that she respects her husband” (Eph 5:33b). Then Paul says that “the two shall become one flesh” (Eph 6:31b) which clearly “refers to Christ and the church” (Eph 6:32). Maybe that’s it! The church and Christ become one through the Spirit; the church as the Bride will marry Christ as His second coming and even now are betrothed to Him and have become one already. So the church must “respect Christ” as the wife is to respect the husband and the Bridegroom (Christ) has already loved the church that He willingly died for her so husbands must be willing to do likewise. Has this mystery been solved? The Book of Ephesians is one of my favorite books in the Bible. It shows the mystery of Christ’s relationship with His church and how the church should regard or respect Christ by being in submission to Him as the wife should be to her husband (Eph 5:24-25) just as Christ submitted to the Father’s will, even though He is co-equal with God the Father in all respects. There are many Bible study books but the ones on the Book of Ephesians will truly be one that will give you great rewards, even though you might be left with more questions than answers.